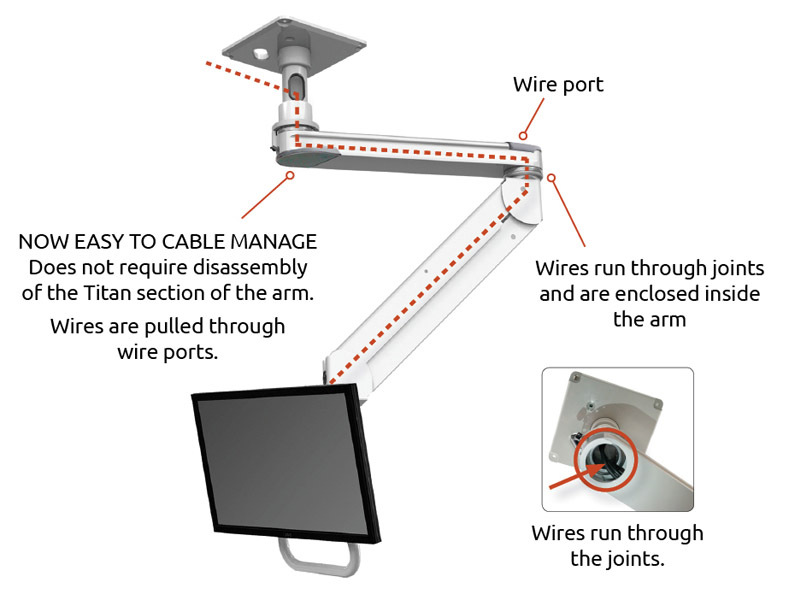 New “Easy-to-Wire” Titan Elite Ceiling Mount | ICWUSA.com Inc.
ICW has created an easy-to-wire Titan Elite that does not require disassembly of the Titan section of the arm for cable management. Wires are easily pulled through special wire ports. Wires run through the joints and are enclosed inside the arm. New design is stronger and more rigid. Design changes are for only the T2EQ Quicklink model and the New T2EV with friction adjuster. There is no change in price. For more information about the new easy-to-wire Titan Elite Ceiling Mount, please contact your ICW representative or call one of our product specialists at 1-800-558-4435.